So when was the last time I wrote a post ? Months ago! Yes, it seems I’m horrible at this blogging thing. Maybe doing a PhD and blogging about baking just don’t work together but oh well. As much as I love baking, and more so cake decorating, I have been trying to eat healthier for the past few months which is another reason I’ve been hush hush. I’m not on a strict diet per say but I’m trying to eliminate refined sugar and use more natural ingredients. In a sense, I’m doing a light version of the paleo diet. I’ve tried different recipes for dessert (these brownies are by far my favorite), but the challenge is how to decorate them without using a ton of sugar (aka buttercream icing) so lately I’ve experimented with different frostings. My friend shared this recipe for chocolate quinoa cupcakes with me (yes, using cooked quinoa who knew!) and the best part is it had an icing recipe with it. The icing was surprisingly very tasty. I used the chocolate version, I couldn’t get it to the right consistency just using the egg white and honey. 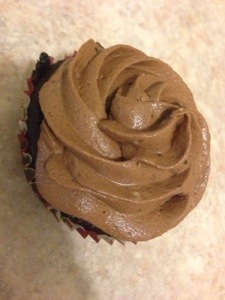 With the chocolate, the consistency was good enough to be swirled on top of a cupcake (see pic). I think you could also frost a cake with it, but it’s too soft to do any other kinds of decorating such as flowers etc. but at least u get nice looking cupcakes. Maybe, there are ways to decorate things without sugar after all!